If you haven’t already heard, a major exploit in OpenSSL was discovered recently. 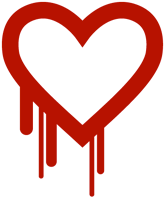 The Heartbleed Bug, which is as scary as it sounds, allows an attacker to capture potentially sensitive information from a server’s memory by exploiting a flaw in the implementation of the heartbeat function of OpenSSL’s SSL/TLS implementation. Client: You still there? If so, send back “ALIVE,” which is five characters. If the heartbeat succeeds, the connection stays open. This keeps happening, over and over, with a different value being passed each time. Client: You still there? If so, send back “KITTEN,” which is 300 characters. Server: KITTEN, and here’s a block of random memory from RAM! In this manner, an attacker can get a random 64KB chunk of data from memory every time a heartbeat is sent, thanks to a lack of validation of the length parameter. (So an attacker can just repeatedly make attempts.) Eventually, they’d get lucky and find something interesting. Such as the SSL certificate or users’ passwords and data. Exploiting this bug is trivial. (There were people posting scripts to test for the vulnerability minutes after it was announced. Just imagine how quickly malicious types got to work implementing exploits for the bug!) It’s also possible that someone knew about it months or even a couple years ago, and has been exploiting it ever since. Bloomberg even suggests that the NSA has known about it for two years, and has been exploiting it rather than disclosing the problem. You should now revoke any SSL certificates and issue new ones, in case they were leaked in an exploit of the bug. What Should I Do, as a User? Change your passwords! For anything important—email, banking, etc.—you should consider picking a new password. HTML5’s localStorage API makes it possible for a web page to store 5-10MB of persistent data, much like cookies, but for more complex data—as you probably already know if you’re familiar with HTML5’s fancy new APIs. Feross Aboukhadijeh came up with an interesting and relevant proof-of-concept that’s been making its rounds on the internet: a little something called FillDisk. Apparently Chrome, Safari, Internet Explorer and Opera all have a flaw in their localStorage implementations that allow a website to use a little trick to fill your hard disk up. They allow each subdomain of an origin to have its own storage pool, so you can bypass the quota by looping around and storing data for tons of subdomains. FillDisk manages 1GB per 16 seconds on the author’s MacBook Pro. Firefox gets it right and sets the quota for the entire second-level domain. Now Mozilla’s solution doesn’t exactly seem optimal to me. There are plenty of sites that allow users to host things on subdomains, GitHub Pages being a noteworthy example. It seems to me that a more equitable solution is to extend the partial solution Firefox implements and prompt the user to allow the pool to be enlarged when needed. PHP 5.5 will be gaining a simpler and more newbie-friendly way to securely hash passwords. As those who are active in the PHP community are all to well aware of, it is quite a trial to educate everyone on properly securing passwords in their applications. Even large web companies are routinely outed for their lax measures. Sometimes they’re stored in plain text and sometimes they might as well be, like when weak MD5 or SHA1 hashes are used. Remember the big scandal when Gawker Media’s database of user passwords was leaked, and the weak hashes were solved within days? Or more recently, when it was discovered that Pandora not only stored your password in cleartext, but transmitted it that way as well? It seems that at least two well-known websites have a similar “facepalm” moment every year. The PHP contributors want to help combat this problem—at least among companies using PHP, obviously the issue is by no means limited to PHP developers—with the new API. A couple of simple functions that even the most novice of developers can use will automatically take care of the hashing using bcrypt with a reasonable work factor. For compatibility with versions of PHP prior to 5.5, you can even download a PHP implementation that will automatically be disabled in a PHP 5.5 environment. There’s a post going around on Google Plus that shows off a glaring security hole in the popular internet radio site Pandora. If you use FireBug (or the HTML inspection tool in your browser of choice), you can see that the Password field on the account settings page clearly shows your password in the value attribute. It displays bullets because it’s a password type form field instead of a plain input, but the password is still right there. That’s not good, however you look at it. While updates to the post explain that it’s not necessarily indicative that Pandora is storing passwords in their database in plaintext—they could just be caching them client-side—it’s definitely in the realm of possibility. Not using a slow one-way hash and this sort of thing tend to go hand in hand. Many people commenting on the subject, whether in editorials, podcasts or discussion forums, would bring up the subject of how strong the users’ cracked passwords were. There were a large percentage of users with weak passwords like qwerty, password, 123456, or monkey. Yes, they are obviously weak passwords. However, I think it’s wrong to use them as an example of bad user-end security practices. I, for one, would never use one of my more secure passwords for an account on a blog or discussion forum. I would be likely to come up with a throwaway that I would never use on a site where I would care if it were compromised. Considering that Gawker’s readers are probably a little more tech-savvy than your grandparents, why assume that they wouldn’t take the same approach? Given Gawker’s security breach, I think it’s a well-justified method to use. A scary new Firefox extension known as Firesheep came onto the scene recently. For years it has been possible for nefarious users to “sniff” unencrypted network packets for session cookies, allowing them to, with a bit of work, hijack your session with a website. This would enable them full access to, say, your email or Facebook account until you log out and destroy the session. This is probably the biggest security risk on a public WiFi hotspot, though until now it was fairly unlikely that you would happen to be on the same network as a nefarious user with the technical chops to pull it off. Until now. Firesheep is a proof of concept that attempts to demonstrate just how big of a problem popular websites’ lack of HTTPS support is…by making “sidejacking” point-and-click simple. Anyone can install the extension, press a button to automatically scan for active sessions of popular websites being transmitted over the network, and then click on an entry to log in to the user’s account on the website. What started out as a fairly innocent project demonstrate to websites like Facebook that they should be implementing SSL encryption has become a major security risk. Firesheep has sort of…went viral. A frightening number of people have downloaded the extension. While developer Eric Butler’s intentions may have been honorable, his extension has had one very negative effect: it has made sidejacking much, much more prevalent. A year ago, I could be fairly sure that nobody on the local McDonalds’ WiFi hotspot would be trying to hijack my Twitter session. After all, I live in a fairly rural state with a low density of exceptionally computer-literate people. Now, some kid could be playing around with Firesheep. This reminds me of the “grey hat” security researchers. They usually don’t have malicious intentions, but their methods can sometimes cause more harm than good. That seems to be Firesheep in a nutshell. Butler’s follow-up blog posts even read like those of a grey hat hacker. 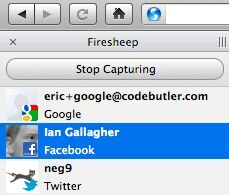 I think Firesheep is the worst kind of way to promote security. It has done far more harm than good. Sidejacking was a fringe thing that you didn’t really have to worry about, except for higher-risk things like banking or checking your email. Now anyone can install a GUI tool and do it without even knowing how it works. This is going beyond enabling script kiddies. It puts cracker tools in the hands of the masses, therefore making sidejacking an actual risk. Do you frequently log-in to your WordPress install over public WiFi networks? While it may seem like paranoia to some people, it’s really not a good idea to log into important sites over an unencrypted connection. There’s always a possibility that someone could be packet sniffing. If you run a high-profile blog, you might want to consider acquiring an SSL certificate. (A certificate is a sort of public key used to establish an encrypted connection.) With a certificate, you can log into WordPress with an HTTPS connection. This encrypts traffic between you and your server, making it impossible for anybody to intercept your password while you work from a café. It’s a bit of a pain to set up SSL, but many web hosts will do it for you. WPWebHost, for instance, will configure SSL for you if you get a certificate. They run around $89/year (I know, what a racket…) from most certificate authorities, and some hosts will charge a small set-up fee. VPS.net, on the other hand, has a deal with Comodo where you can get a free SSL certificate as long as you are hosted by them. You have to set everything up on your own, though. What do you do once you have a security certificate? There’s a Codex article on the subject. There are a couple of WordPress constants in wp-config.php that you can toggle on to force everything in the /wp-admin directory to be served over HTTPS, the login page most importantly. You probably won’t ever have to worry about this, unless you run a very large blog or you like to work from a coffee shop across the street from a computer security convention. WordPress.com users are lucky; they can just go to https://wordpress.com/wp-login.php to log in securely. There has been some misinformation going around about an alleged security vulnerability in WordPress 2.9.2. A bunch of websites were recently compromised, and some people have tried to assign the blame to WordPress. The issue, however, comes from shared web hosts not taking the proper precautions to prevent users from accessing configuration files they shouldn’t have filesystem permissions for. Some misinformed publications are claiming that it’s a WordPress vulnerability stemming from wp-config.php’s plain-text storage of database passwords…something that every database-using script has to do in order to function. Any reversible encryption scheme is just as easily reversible by someone who can access you filesystem, and the one-way hashing used for users’ passwords doesn’t work in this sort of situation. The file should never be directly accessibly by anyone other than the creator on a properly-configured server. A new post on the WordPress development blog is attempting to clear-up the misunderstanding.